I have been backpacking for eight years mostly on long weekends in Southern California with two or more 5-day trips per year in the Sierras. My total daypack weight, including food and water, is usually 15 lb (7 kg) and my total backpack weight, including food and water, is usually 22-26 lb (10-12 kg) depending on the need for a bear canister. I have converted to a tarp and bivy sleep system instead of a tent to keep my pack weight down. I have experienced all night rain, hail, heavy winds, camping in snow once, but mostly fair weather. 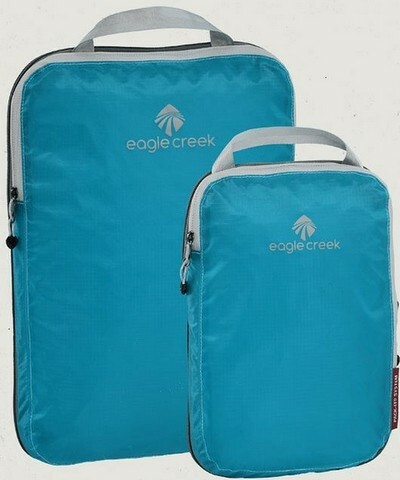 Eagle Creek's Pack-It Specter� Compression Cube Set is a small and large compression sack constructed of ultra-lightweight silnylon ripstop designed for packing and compressing soft items such as clothing. Eagle Creek calls the large sack a cube and the small sack a half cube. 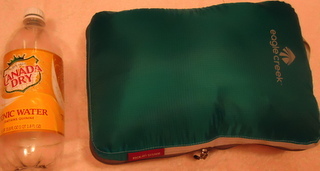 The sacks have a nylon zipper that runs across the top opening from 6 in (15 cm) down from the top edge, across the top and 2 in (5 cm) down the other side. They include a compression zipper that runs around the perimeter of the sacks that can be completely closed, partially open or completely open while loading the items into the sack. 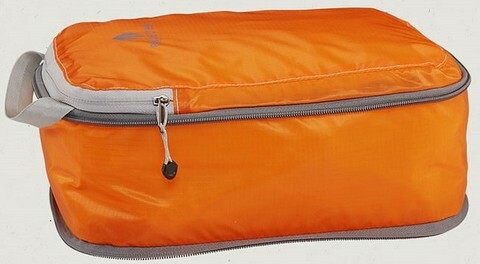 Once the items are packed and the top zipper is closed, the compression zipper can then be closed partially or completely. The sacks include a quick grab handle on the top of each sack. They are water-resistant and stain resistant. The zippers work smooth and do not catch the silnylon material during my initial test of opening and closing them without anything in the sacks. The hang tag states the sacks are water-resistant, stain resistant and can be machine washed. I grabbed the clothes I would usually pack for a backpack trip which include my fleece tights, fleece socks and a long sleeve thermal top for sleeping. I usually don't bring extra clothes to wear during the day except maybe a pair of underwear on a longer trip. I normally leave my Mountain Khakis Rendezvous merino wool long sleeve top loose to add an extra layer for the cool mornings and evenings. I packed all of these items into the large cube and still had room so I stuffed in my 600 fill down jacket which filled up the large cube. I closed the zipper on the contents and then closed the compression zipper all the way shut. In the small cube, I packed my fleece tights, fleece socks and a long sleeve thermal top and closed both zippers. Since I had room left in the large cube after packing these items, I was curious to see if they fit into the smaller cube. It is interesting to note that the Eagle Creek website indicates the sacks are translucent to allow for visibility of the contents. My sacks are teal colored and I am not able to see the contents from the outside. These bags are lightweight and appear to be constructed well. 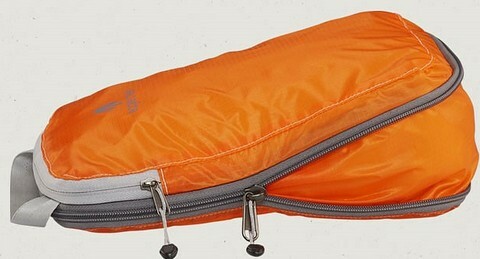 The zippers appear sturdy and should be durable. Since the bags are designed to contain soft items like clothing, I would expect care should be taken in order to store hard cased items. The silnylon ripstop material looks like it should hold up well. I usually pack my clothes in gallon size zip-top bags so they can be used as food or trash bags if needed. I will be interested to see how these compression sacks perform in my backpack and in my suitcase for airline travel. In addition to my backpacking trips, I also flew to Northern California and Oregon using a suitcase. I found these compression sacks to be very useful in organizing my clothing in the suitcase on these trips. All of my clothing for the backpacking trips fit into the large compression sack. I used the small compression sack to keep small items organized in one bag. Once camp was set up, I would change into my clothes for sleeping and then place my daytime clothing into the large sack to form a pillow in my bivy as shown in the picture below. As I am always looking for ways to use items for more than one purpose, not having to carry a pillow was an unexpected use of the large sack. I found the best use of the sacks to be with the compression zipper closed. I accessed my items by opening only the main zipper. 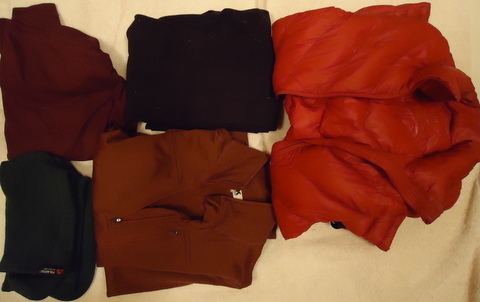 I carried all of the clothing shown in my Initial Report on my backpacking trips. I was careful to use my fingers to keep material from catching when zipping them closed. The zippers performed well and did not catch on any of my clothing. Since I usually compress my clothing in zip-top bags which can then be repurposed if necessary for food or trash, I was curious to see how these sacks would perform. I was pleasantly surprised by how well they compressed my clothing and other small items to keep them organized. It didn't matter that I couldn't see my clothing from the outside because I only put my clothes in the large sack. The sacks did not pick up any stains or become damaged. The sacks and their zippers still look and work like when they were new. Fitting the large sack in my backpack when it was filled with my clothing and then compressed presented another challenge. Prior to using these sacks, I would usually place my clothing in two gallon size zip-top bags which are easier to pack in a backpack. After I tried several different configurations, I decided that since I didn't need my sleeping clothing and down jacket during the day, I packed the large sack containing my clothing near the bottom of my pack near my sleeping bag and bivy. The large sack full of my clothing provided stability to the rest of my items to be packed on top of the sack. The small sack containing the smaller items was packed near the top of my pack for easy access during the day. These compression sacks are a useful lightweight method of organizing my backpacking gear. I will continue to use them for my future trips. This test is now completed. Many thanks to Eagle Creek and BackpackGearTest.org for this testing opportunity.